*A flawless strategist, a consummate manipulator, and a genius in everything at which he tries his hand, Doctor Doom is one of Earth's most dangerous Super Villains. 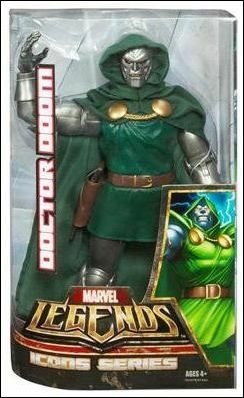 Were this genius turned to the benefit of humanity, Earth might well be a paradise, but Doctor Doom cocerns himself with nothing other than his own quest for absolute power over mankind. Born destitute in the mountains of Eastern Europe and hunted throughout his young life because he was an outsider, Doom rose up to become one of the wealthiest, most powerful men on Earth. All those who opposed him, every force boh natural and mystical that had ever hounded him, fell before him in his rise to power. Indeed, the only people to ever successfully challenge him for long are the members of the Fantastic Four. As a strategic mastermind, maestro of robotic weapons and power manipulator omystical energies, he has tried again and again to prove himself superior to Reed Richards and his family, but every time has fallen just short of victory. As the years have passed and his defeats have mounted, his obsession with the destruction of the Fantastic Four has grown. He will sop at nothing in his quest for victory, even feeding the citizens of his own beloved Latveria into the flames of his crusade.